Mexico’s largest, and sole global, carrier Grupo Aeromexico appears to be executing a dual strategy in 2014, split between retaining its commanding presence in the domestic market while leveraging its international networks and partnership roster to ensure it can weather the country’s economic uncertainty. Two of the carrier’s major milestones in 2014 are the introduction of the Boeing 787 widebody and overhauling its operations in Mexico City through expanding connecting banks and eliminating small jets from its largest hub. As the competitive dynamics in Mexico’s domestic space continue to shake out, Aeromexico is pressing forward to build a strong foundation to withstand increasing pressure on routes within Mexico. As Mexico’s GDP registered just 1% during 2013, Aeromexico managed to record a 3% increase in its FY2013 profits to USD75 million, compared to a 30% decrease in profitability for Volaris – Mexico’s other publicly traded carrier – to USD15 million. Unlike Volaris (and Mexico’s two other larger carriers Interjet and VivaAerobus), Aeromexico has a larger international presence that helped to dull some of the yield pressure created by the lack of fare traction within Mexico during FY2013. 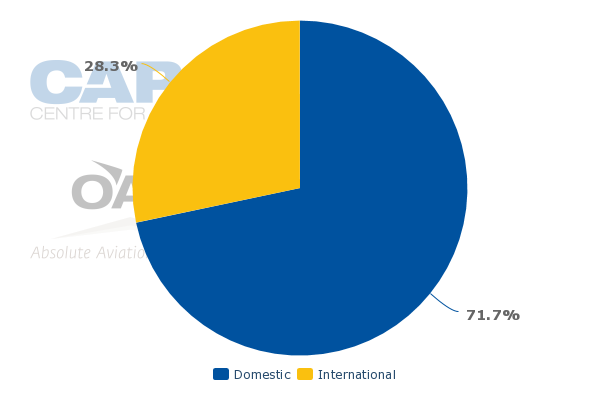 Presently, 28% of Aeromexico’s seats are deployed into international markets. Despite a nearly 5% decline in yields for FY2013, Aeromexico’s top-line revenues increased almost 2% to USD3 billion, driven largely by improved conditions in its international markets. Aeromexico’s international plans for 2014 include adding five Boeing 787s to its long-haul fleet by May-2014. 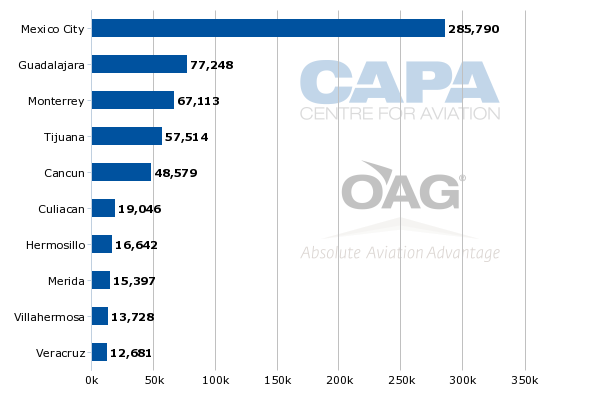 According to the CAPA Fleet Database, the airline already has three of the new widebody aircraft in service, joining its existing widebody fleet of five 767s and four 777-200ERs. The carrier is deploying the new 787s on daily flights to Paris and New York, four weekly services to Tokyo Narita and three weekly flights to London and Madrid. The carrier also plans to introduce new service to Rio de Janeiro in Jun-2014, a route not currently served by any other airline. Rio is part of Aeromexico’s strategy to position Mexico City as a favourable connecting point between the US and Latin America. It believes Rio and new service to Quito that debuted in Dec-2013 are helping to increase Mexico City’s attractiveness as a Latin American transit point. Another element of Aeromexico’s strategy to maximise connectivity in Mexico City is increasing connecting banks at the airport from six to 10 and cutting small 50-seat jet operations in the market. At the same time the carrier is introducing a shuttle service in three of Mexico’s largest business markets – Mexico City to Monterrey and Guadalajara, and Monterrey to Guadalajara. Through the additional banks, the elimination of small jets and the introduction of shuttle routes in Mexico City, Aeromexico appears to be leveraging its status as Mexico City Juarez’s leading carrier to sustain is commanding presence in both domestic and international markets in Mexico. Aeromexico has been attempting to rebuild some of its domestic market share after its younger rivals – particularly Interjet and Volaris – have rapidly made inroads in Mexico’s domestic space during the past few years, and in 2013 captured domestic shares of 24% and 23%, respectively. In 2013 Aeromexico opted to trade yields for loads in order to sustain its leading domestic market share, which was 36% in CY2013, just 1ppt below the 37% it held in CY2012. It presently has a commanding seat share in five of Mexico’s top 10 domestic markets by arrivals in Mexico City, Monterrey, Hermosillo, Merida and Veracruz, and is second at other airports with the exception of Cancun, which garners a lot of international service. 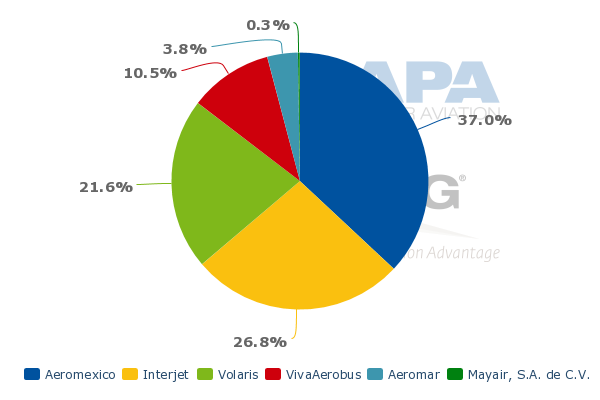 Overall, Aeromexico represents a 37% domestic seat share in Mexico. There is a possibility that Aeromexico could see some pressure in Monterrey during 2014 as Volaris began establishing the airport as its fifth domestic base in 1Q2014. In total Volaris is introducing eight new routes from Monterrey and basing three Airbus A320 narrowbodies at the airport. But it seems as if VivaAerobus might feel more pressure from Volaris’ expansion as the two airlines bill themselves as true low-cost carriers, and compete for the same passenger segment. However, Aeromexico also appears to be courting at least part of that passenger group, evidenced by the new low fare product Contigo it introduced in Guadalajara during 2013 that largely targets migrant workers travelling in US transborder markets. The new product definitely pressured Guadalajara’s largest carrier Volaris, which has previously estimated that fares in some markets from Guadalajara and Tijuana fell by 30% to 40% during 4Q2013. The Contigo subsidiary debuted in Oct-2013, indicating Aeromexico’s resolve to respond actively to its rivals carving out their respective niches within the Mexican market place. Both Aeromexico and Volaris believe market conditions should improve during 2014 as Volaris is predicting load factors in the mid-80s for CY2014, and predicts that unlike in 2013, it can compensate for lower yields with high loads. During the first two months of 2014, Aeromexico recorded favourable traffic results as its traffic jumped 22% year-on-year on 13% ASK growth, resulting in a 5.7ppt improvement in load factor to 79%. Domestic traffic increased nearly 18% on an 8% increase in ASKs, which resulted in a 6ppt rise in loads to 75%. Aeromexico’s traffic in international markets jumped 24% year-on-year as capacity grew 16%, lifting load factors 5ppt to 81%. Aeromexico is still likely trading yields for loads in the domestic space, but its larger international presence gives the carrier some leverage to dilute yields on domestic markets. Mexican airlines review Part 2: Is Interjet emerging as Mexico’s true hybrid carrier? As a member of the SkyTeam alliance, Aeromexico has a broader base of international partners than its Mexican rivals. During the last couple of years it has bolstered its relationship with Delta Air Lines after the US major took an equity stake in Aeromexico. The airlines now estimate that nearly five million passengers annually travel under their partnership. Aeromexico has access to Delta’s vast US network while Delta deposits passengers into Mexico City for connections on Aeromexico that ultimately boost Aeromexico’s revenue and traffic. Aeromexico’s dual shield of larger international offerings and key partners like Delta, which has a vested interest in ensuring Aeromexico’s viability, do give it strategic advantages not enjoyed by its domestic rivals. While no carrier was spared from the weaker pricing within Mexico’s domestic market place in 2013, Aeromexico managed to stay on reasonably sound financial footing for the year. The obvious challenge is to sustain that momentum, which will not be easy for Aeromexico. But its fortification of Mexico City and its recent moves to pressure Volaris show that Aeromexico is ready to flex its competitive muscle in the face of continuing competition within the domestic space. Overall, Aeromexico seems to be laying a solid foundation on which to rest if Mexico’s economic recovery fails to materialise.